This is VERY cool! Of course I love robots anytime (Data was always my favorite...). So is this a Ninja Robot or a Samurai Robot?? The Cybermen are fighting the Silurian, Vastra and her partner Jenny Flint. They featured in earlier episodes of Dr Who and take the place of Sherlock Homes in Victorian London. They are joined by the Sontarian, Strax to help the Doctor in the latest Christmas episode - which i am assuming you haven't seen yet! This does not include Cybermen and this panel is the work of a fan. Oh I DID see the Snowmen! BBCAmerica (I'm so glad I get that channel now) has been awesome about showing us (ie the U.S.) Doctor Who the same day you get to see it (just 6 or so hours later). 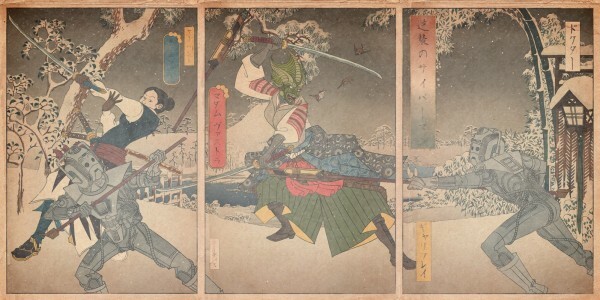 The pictures above looked so perfect as Japanese prints that I was focused on the cybermen (but thinking they were normal robots) and I didn't realize that they were fighting Vastra and Jenny Flint... that is so cool! I'm afraid I don't always pick up all the details of what I'm seeing, I was distracted by the fact that they looked like ancient Japanese prints (which was the intention I'm sure). Where did you find this? It is beautifully done. I have to say that the Christmas Snowmen episode was pretty incredible, a friend had come over to watch it with me and we were both laughing a lot and getting kind of scared! I'm definitely looking forward to Clara being the next companion.